Information about the Nov. 8 election is available on the Your Vote Matters page of Missouri Health Matters. Hospitals can help educate their communities about the election using the resources on MHAnet. There’s an outstanding lineup of speakers scheduled for MHA’s 94th Annual Convention and Trade Show next week — don’t forget to register! The Medicare Access and CHIP Reauthorization Act of 2015 rule was finalized by the U.S. Department of Health & Human Services — MHA distributed an issue brief last week. The 2017 Marketplace health insurance plan and price data are available on HealthCare.gov. A scenario builder also is available for those interested in signing up for the 2017 plan year. In Missouri, insurers include Anthem BCBS, Blue Cross and Blue Shield of Kansas City, CIGNA, and Humana. As predicted, the number of insurer options in Missouri has significantly decreased. In 2016, more than 98 percent of the counties in Missouri had a choice of three or more insurers. In 2017, the number decreased to approximately 16 percent, leaving 84 percent of the counties in Missouri with only one insurer option. The 2017 Marketplace open enrollment begins Tuesday, Nov. 1. 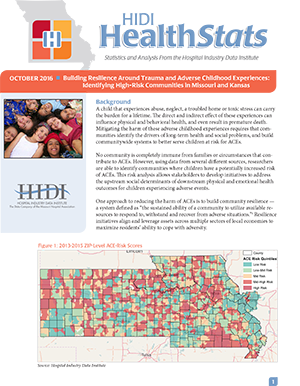 The October issue of HIDI HealthStats reviews the importance of building resilience around trauma and adverse childhood experiences. The issue identifies high-risk communities in Missouri and Kansas. Gun-related violence has been referred to as a public health threat in the U.S. Throughout 2015, there were more than 40,000 acts of violence with firearms in the U.S., including 372 mass shootings. One-third of victims (13,286) died as a result of their injuries. Missouri and Kansas ended 2015 with 5,054 hospital visits for shooting victims — this was a 27.4 percent increase throughout 10 years. The 20 ZIP codes in each state that had the most residents treated in a hospital for gun-related injuries were represented in large disproportion to their total populations. In Missouri, 20 ZIP codes, accounting for only 7 percent of the total population in 2015, accounted for 38 percent of hospital visits for gun-related injuries. In Kansas, the disparity was 17 percent of the population compared to 43 percent of shootings treated in a hospital setting in 2015. The rates of gun-related hospital utilization for the top-20 ZIP codes in Missouri and Kansas also have trended upward between 2013 and 2015, including an 82 percent jump in the top-20 Missouri ZIP codes during the last three years evaluated. These ZIP codes in Missouri had a gun-related hospital utilization rate that was 845 percent higher than the rest of the state in 2015. For Kansas, the difference was 233 percent. 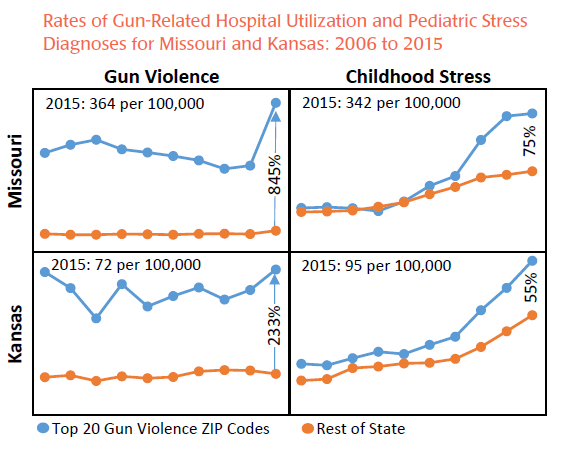 The rates of toxic stress-related diagnoses for children in the top-20 highest gun-related hospital utilization ZIP codes also are significantly higher than other communities in Missouri and Kansas. Throughout 2015, the rate of stress-related hospital diagnoses — including post-traumatic stress disorder — was 75 and 55 percent higher in the top-20 ZIP codes in Missouri and Kansas, respectively. The rates of stress-related diagnoses for children in these ZIP codes were similar to statewide rates until 2010 when the trends diverged sharply in each state. The Centers for Medicare & Medicaid Services and The Joint Commission have determined that an addendum is required for the Specifications Manual for National Hospital Inpatient Quality Measures, version 5.2, for implementation with acute inpatient discharges from Jan. 1 through Dec. 31, 2017. Updates include removal of retired measures and revisions to the data dictionary, tables and appendices. A complete list of changes is available in the manual’s release notes, version 5.2a. Changes were made based on the inpatient PPS final rule for calendar year 2017 and ongoing alignment discussion between CMS and TJC. The addendum is available on QualityNet and TJC’s website. Last week, the Centers for Disease Control and Prevention restored $44.25 million in funding to states for all-hazards preparedness. Funding from cooperative agreements with 62 states, cities and territories previously were redirected in March 2016 to support the response to Zika. With the finalization of the fiscal year 2016 Zika supplemental funding in late September, funds were budgeted to restore the Public Health Emergency Preparedness cooperative agreements to prior funding levels. This week is recognized nationally as Health Care Facilities and Engineering Week, which helps health care organizations acknowledge staff who are responsible for managing and ensuring a safe environment for patient care. Gov. Nixon has issued a proclamation in recognition of the Missouri Society for Healthcare Engineers’ efforts. The Centers for Disease Control and Prevention’s Clinician Outreach and Communication Activity is hosting a call to discuss new and established recommendations for the 2016-2017 flu season, specifically related to flu vaccination for children. Panelists from the American Academy of Pediatrics and the CDC will discuss strategies that clinicians can use to prevent flu in children. The call will be held at 1 p.m. Thursday, Oct. 27. Either dial 888/566-7688 and enter passcode 1528968 to participate, or join by webinar. The Centers for Medicare & Medicaid Services is hosting a call from 12:30 to 2 p.m. Tuesday, Nov. 15, to review provisions in the quality payment program final rule. Register online. This week is Red Ribbon Week. Children of parents who regularly talk to their teens about drugs are 42 percent less likely to use drugs than those who don’t, yet only a quarter of teens report having these conversations.